We are beyond excited to be a part of the opening of this brand-new venue!! Come check it out with us for the very first time at their Open House this Sunday, January 20th from 3-7pm. 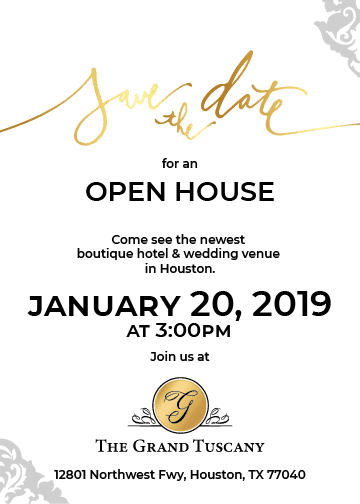 Houston’s newest Boutique Hotel & Wedding Venue!! What used to be the Old Crown Plaza is now the Grand Tuscany Hotel. An upscale renovation with everything you could imagine! We may not know their story yet, but we know they will be to die for! If you are looking for your perfect Elegant Venue, then this may be everything you were looking for! 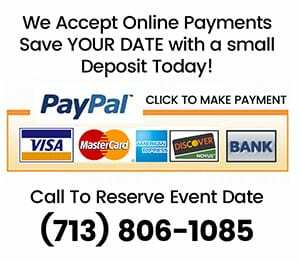 Come check out what they are bringing to the table for Houston’s Wedding Industry. With free valet parking, We Hope To See You There! !